A few nights ago, I made a fire in the outdoor firepit. Why is it that when you WANT to start a fire, it’s often a challenge to get it going with the newspaper and tinder teepee? People have accidentally burned down their home by smoking in bed or playing with matches, but when you want to get a campfire going, it can be tough! In any case, I finally did get it going. As I watched the flames slowly build and consume the dry wood, I had some time to reflect. As beautiful as the fire was, my mind was drawn to sin and how it often can consume us if we are not careful. The wood I used was dry, but not too old. It was a soft wood — not the best for burning in a fire, but it was what I had on-hand after losing some branches to a storm last fall. The bark was still intact, and I could tell there was still a great deal of moisture left in the heart of the wood, as the smoke was thick and pungent, and it took a while for the wood to actually start to burn. Sin can be like that for us: it can take some time until we start to burn under the temptation. When we’re a Believer walking with the Lord, we’re not always the easiest target for the prowling lion to devour, but when we suffer some kind of loss or spiritual test of our will, we can be weakened. That prowling lion is always ready to pounce. He watches for our weaknesses. When we’re put into the flame, it often takes some time until we give into the sin. We choose to stay in the Word, we spend time in prayer, we ask others to pray for us, and we remind ourselves about the path we are supposed to be on, but if we aren’t careful, we can be slowly overtaken by the sin — much like the wood can be overtaken by the flames. A fire, when it has fuel, will grow. Sin, when it has fuel, will grow. 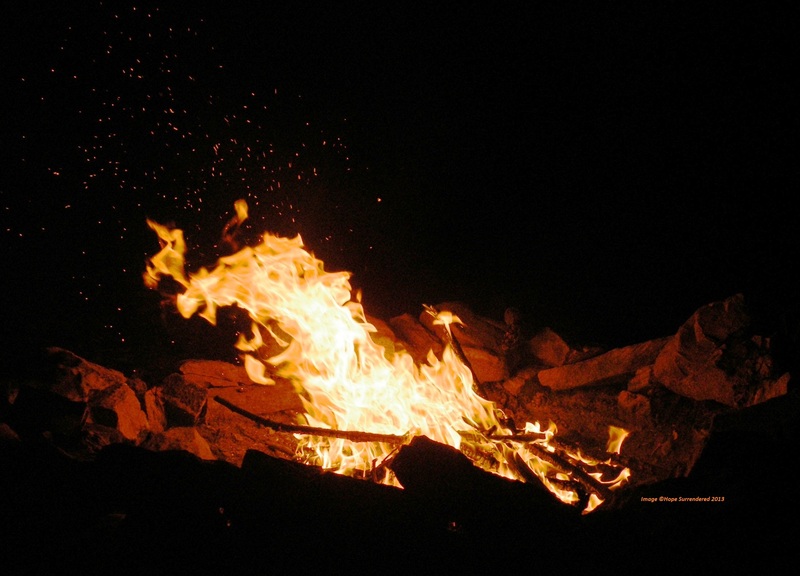 The flames dance around as they change the still-fresh, bark-covered wood into an ashen-covered char. We dance around our temptations. We justify them, and we justify why we can handle them — because we are Believers. Eventually, the glow of blue, orange, yellow and red takes over the wood, and a seething-hot bed of coals begins to form beneath the wood that stands little chance of survival. For us, we can eventually be worn down from the temptations, from the worldly viewpoint, from our challenges and justifications. Sin provides us with a distraction, a place where we can be different, a place where we can fit in — this is our bed of coals. It is here that we stand little chance to escape unharmed and unchanged. A dancing fire. An enticing sin. except what is common to humanity. The hope is in the Word. It’s in knowing that there is always a way of escape. Watch those flames!